This is my first post of images from my sketchbook. Keeping a sketchbook is a new approach for me and I have to admit to approaching it with some trepidation as, like many people, I will instantly say that I can’t draw. I was reassured therefore to read through lots of information on sketchbooks and realise that it is OK to make a mess, play and not produce “nice” drawings and that the sketchbook is another tool in the textile artist’s arsenal. 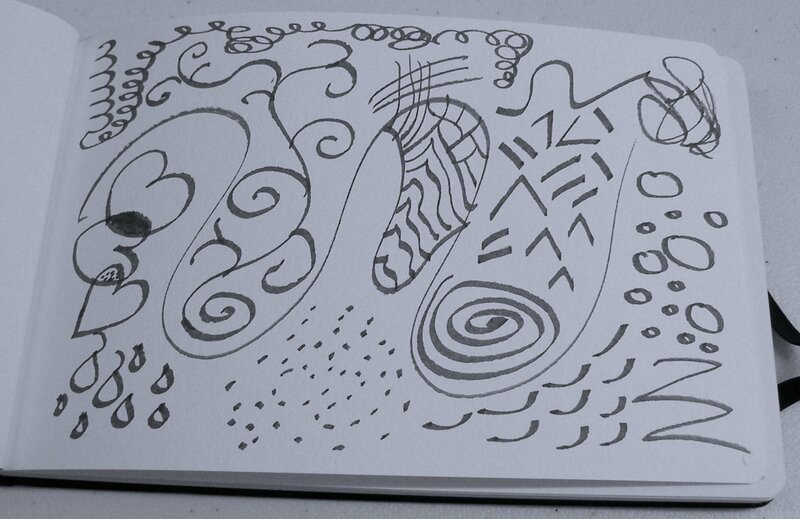 So to start my sketchbook, faced with a pristine blank page, I simply grabbed my favourite calligraphy pen and drew a squiggly line. That bit over with I proceeded to doodle over the page. Phew – I had made a start! After making a relaxed start of course I then promptly tried to do “nice” drawings! 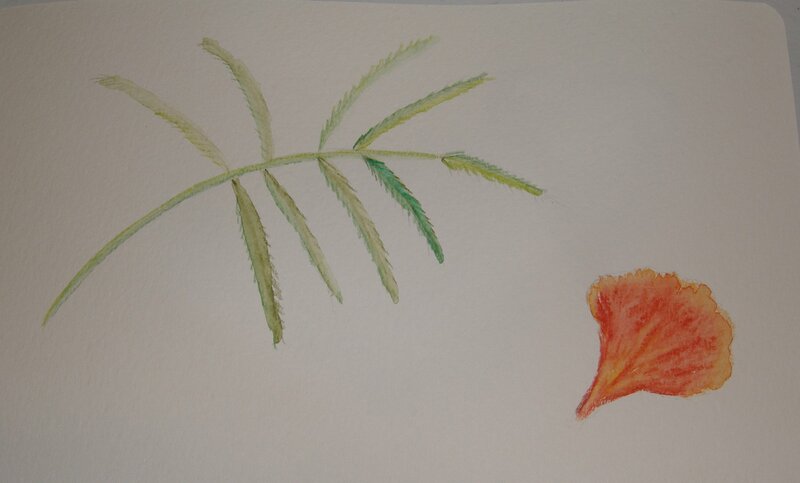 I cut a flower and leaf from a Poinsiana tree in the garden and did a pencil outline then shaded with watercolour pencils. I am finding that watercolour pencils are turning into my favourite drawing medium so I must remember not to neglect other mediums or become too attached to the pencils. Here are my two pages showing the flower, stamens, bud, leaf and single petal. I was pleased with the way these turned out, particularly the shading on the flower. 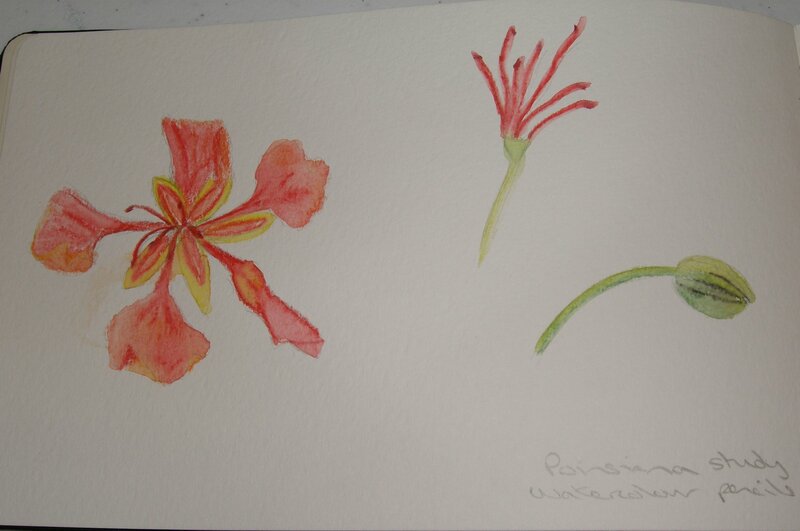 I did a few other watercolour pencil drawings which I will show separately, then I few days later I revisited the Poinsiana. I traced over the flower and slightly enlarged the drawing. Then I printed it onto matt photo paper and cut the drawing into strips. 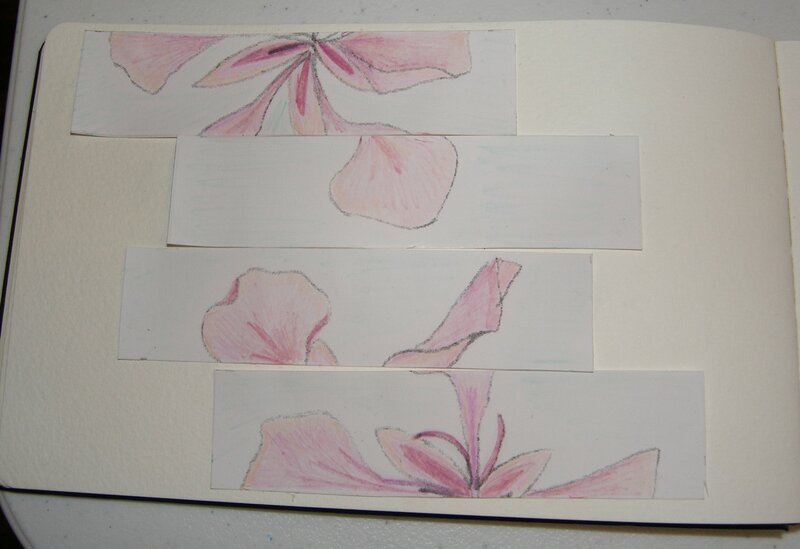 I rearranged the strips out of order and stuck them into my sketchbook, then used different colours to fill in the flower. I like the result although I think I could improve it by using bolder colours with acrylic paint instead of the pastel watercolours. 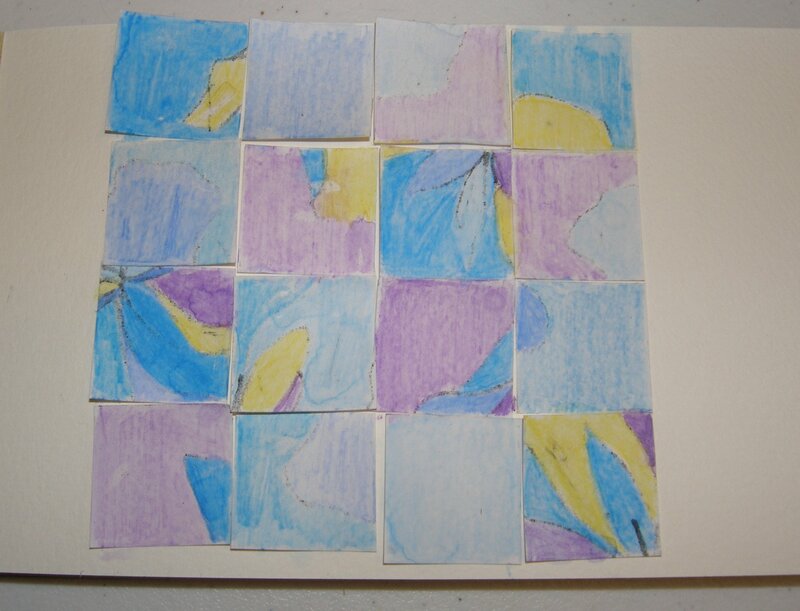 I found that the watercolour pencils did not work as well on the photo paper so I would be better reproducing the image directly onto the sketchbook page. – my choice of colours was not effective. So if doing this again I would improve it by choosing a more detailed image so there were more lines and shapes, and I would choose a different colour palette of stronger colours although I do think the strong blue and contrasting yellow worked well. I do think these last two experiments have potential for use with other images and then for turning into textile pieces, perhaps by printing the image onto fabric first and then doing fabric collage, couched threads and stitching on top.